^ 1.0 1.1 1.2 British national formulary: BNF 69 69. British Medical Association. 2015: 683. ISBN 9780857111562. 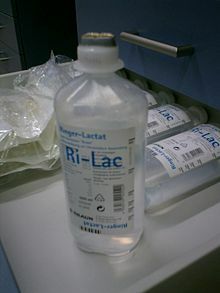 ^ 2.0 2.1 2.2 2.3 2.4 2.5 Compound Sodium Lactate Solution for Infusion - Summary of Product Characteristics (SPC) - (eMC). www.medicines.org.uk. February 2013 [14 January 2017]. （原始内容存档于16 January 2017）. ^ 3.0 3.1 Krieglstein, G. K. Atlas of Ophthalmology. Springer Science & Business Media. 2000: 377. ISBN 9783540780694. （原始内容存档于2017-01-16） （英语）. ^ 4.0 4.1 4.2 Marino, Paul L.; Sutin, Kenneth M. The ICU Book 3. Lippincott Williams & Wilkins. 2012: 363. ISBN 9781451161557. （原始内容存档于2017-09-18） （英语）. ^ Saade, George R.; Foley, Michael R.; Phelan, Jeffrey P.; III, Gary A. Dildy. Critical Care Obstetrics. John Wiley & Sons. 2010: 70. ISBN 9781444396140. （原始内容存档于2017-01-16） （英语）. ^ WHO Model List of Essential Medicines (19th List) (PDF). World Health Organization. April 2015 [8 December 2016]. （原始内容存档 (PDF)于13 December 2016）. ^ Sodium Lactate Compound. International Drug Price Indicator Guide. [8 December 2016]. ^ Marino, Paul L. Marino's The ICU Book 4. Lippincott Williams & Wilkins. 2013: 223. ISBN 9781469831640. （原始内容存档于2017-01-16） （英语）. ^ Bjarby, Johan. Vätsketerapi för AT/ST läkare KSS — 'Rehydration therapy for interns ans specialists, KSS' (PDF). Västragötalandsregionen. [13 January 2017]. （原始内容 (PDF)存档于2017-01-16）.